Venice doesn't have the monopoly on canals in Italy, you know. 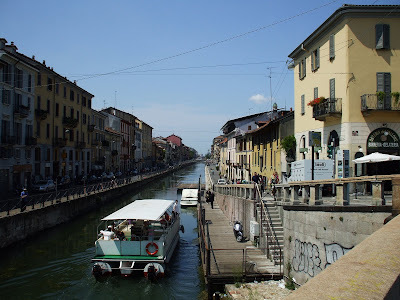 This is the Naviglio Grande, by the darsena or port of Milan in the southwest corner of the city. I took a trip on the water on this nice boat, piloted by a stylish lady all in white, the other weekend. The industrial heritage of the Navigli is protected nowadays, in classic Italian style, with lots of attention to artistic detail and but slightly confused in its more practical elements. 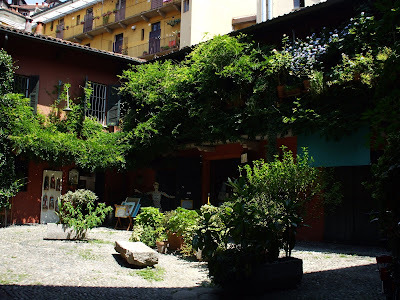 This was the nice arty courtyard where the canal protection people have their offices and sell original watercolours too. Milan is Venice backwards. Man-made waterways through the ocean of fertile fields and factories of Lombardy, rather than man-made islands in a lagoon: but the point is the same, to make money. Unlike Paris or London, or even Rome and Turin, Milan's rivers are nothing to write home about; the Olona, the Lambro (which also runs through Monza) pretty but shallow, and the Seveso, which runs into Milan from the North, famous for its black water - the colour used to be due to the minerals leeching in from the soil, now it's just highly polluted - and which has been for the most part put underground, only to come to the surface every time there's a heavy downpour, as happened last month, causing chaos for commuters to the Northern hinterland. The idea to build canals to link this land-rich but land-locked city with the sea is probably as old as boats. Two big rivers, the Adda and the Ticino, pass within a few dozen miles of the city on each side, both coming out of one of Italy's big lakes and heading South for the mighty Po which underlines Milan in a West-East direction, off to throw itself into the Adriatic. 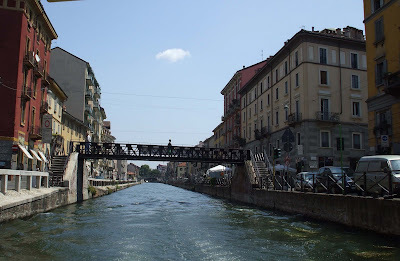 In 1177 work began in earnest on the first canal, the Naviglio Grande, from the Ticino river: the first twenty miles taking some fifty years to complete. By 1272 it was finished, navigable from Lago Maggiore (and therefore Switzerland and all points Northern European) down the Ticino all the way to Porta Ticinese on the city's western edge. 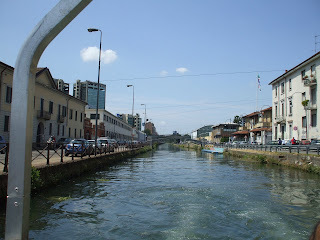 Other canals followed, in particular the 15th century Martesana, from the opposite side of the city out towards the Adda, and the Pavese, going South to Pavia, also on the river Po. 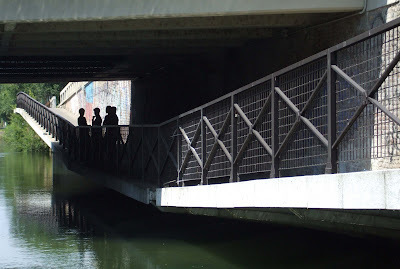 This modern underpass, now a hang-out for the local lads, recalls the heyday of towpaths on the Naviglio Grande. 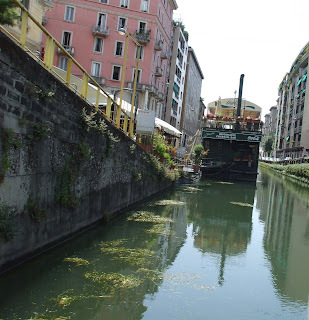 The canals provided pretty much everything: drinking, washing, working water, as well as a handy open sewer. Artisans set up shop here next to the eating places, wharves and warehouses. Barges, called cobbi, like the one above, brought in and took away raw materials - salt, sand, cloth and cheese, milk and cream too, of course: cream in the Lombard dialect is mascherpa; a lot of cream, then, is mascarpone... also shipped in on the five feet of canal water, these days as clear as a bell, was grain, wine, animals and people. The canals were used to get the marble in to the area of the duomo in Milan, and ship it even further south via the great rivers; the stones would be marked Ad Usum Fabricae Opera - for building purposes, in this case church building and therefore exempt from paying custom taxes. Back then, any goods passing through the city had to pay duty, so the idea of the wealthy church getting in free must have seemed a bit cheeky: today to scrounge something, especially a meal, is said to be 'a ufo' - no flying saucers involved. 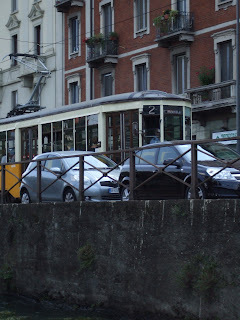 Until the introduction of trams in the 1800s, the canals also provided public transport around the city. This is S Cristoforo, the 'first house by the waterside' of the Naviglio Grande: when the bargees got here they knew they were almost arrived. The church is very ancient, in fact it's two medieval churches linked by a Renaissance apse, long before the Naviglio, this was a sort of spaghetti junction on the Lambro river for commercial rafts and pilgrims alike, hence the name of the church. This is a proudly working class area. 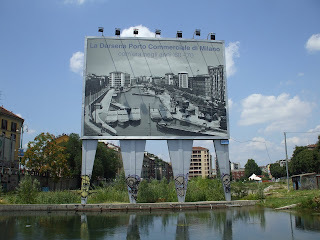 The industrial heritage is perhaps best illustrated by this poster, also at the Darsena. But celebrating history doesn't seem to translate into civic pride: under the poster celebrating the last hurrah of the canal system as a source of income for the area in the 1960's, there are gang symbols, weeds and trash that seem to contradict the idea of a town determined to treasure the memory of its serious working past. Perhaps not though. Money spent on weedkiller might simply not be available. Of course, in centuries past this is an area that would have been home to a big slice of the city's working poor. 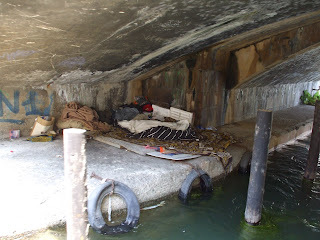 There are still plenty of poor people in Milan, as we were reminded by the sight of this homeless person's little nest under a bridge very close to the Darsena (that's from the arabic for port, the point where the cobbi coming from Pavia and from the Ticino river come together). 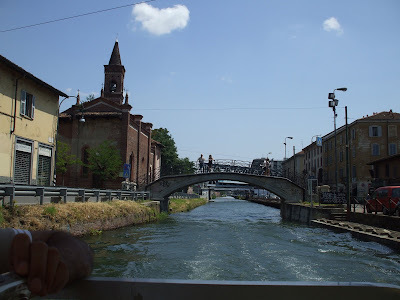 The boat tour takes you up and down considerable sections two of the navigli, both of historis importance, and turning around with acres of water ahead gave us all the sense we'd like to keep going, to see more of the countryside beyond the edge of the city. Well, maybe not the first turning point, which was here, at the end of the line for the boat trip down the Naviglio Grande, here begin the skyscrapers, and the country opened out into what looked like some prosaic suburbia of garages and offices. Instead, the Pavese has a different atmosphere, smarter bridges span it, and the buildings along its banks are more gentrified. It seemed to me the same bit of canal and boat that you can see on this video by Le Vibrazioni. The cobbi parked here are bars and restaurants and balere and flower boxes strew geraniums onto the water. 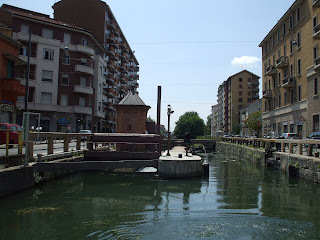 The point of no progress is different too: rather than turning round in open water, as it seemed on the Naviglio Grande, here the way is barred by a lock, this lock had a torre di controllo and, wonder of wonders, a (diligent!) man in it, apparently lock keeper is still a job in Milan. He opened the gates invitingly, and I think we all hoped the pilot would decide to take us down to Pavia, just for kicks, a 45 minute ride each way. Instead she effected a neat 7 point turn. We got a long explanation of how the lock was an invention of Leonardo da Vinci and some lute music, so it wasn't all bad.